Heads of RFAs and high-level officials of relevant institutions convene at the 2nd High-level RFA Dialogue in Washington, D.C, on October 11, 2017. WASHINGTON, D.C., USA, October 11, 2017 – Today, heads of regional financing arrangements (RFAs) around the globe convened at the 2nd High-level RFA Dialogue in Washington, D.C, USA, to discuss new developments in their institutions and respective regions, and cooperation among RFAs and with the International Monetary Fund (IMF). Inaugurated in October 2016 and co-organized by the ASEAN+3 Macroeconomic Research Office (AMRO), the European Stability Mechanism (ESM), and the Fondo Latinoamericano de Reservas (FLAR), this annual high-level dialogue is a platform to discuss key policies pertaining to the developments of RFAs and their contribution to the global financial safety net (GFSN). AMRO Director Dr Junhong Chang speaks at the 2nd High-level RFA Dialogue. At the dialogue, the participating RFAs reported on the recent activities and developments in their institutions and regions since the inaugural high-level dialogue last October. RFAs focused on internal capacity building, with a strong emphasis on transparency and communication strategy. 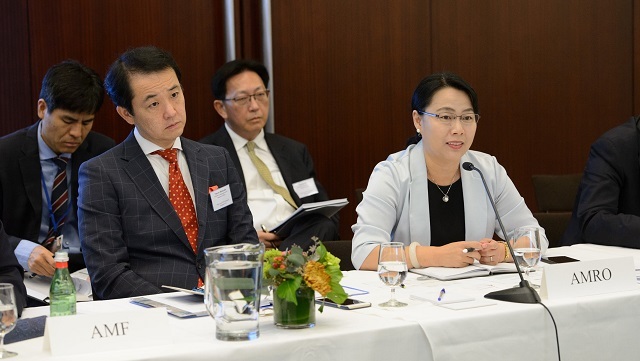 They also welcomed the successful organisation of the first Joint RFA Research Seminar in September 2017 in Singapore and discussed the key takeaways from this event for economic surveillance and crisis prevention. RFAs and the IMF also discussed the IMF’s on-going work of formulating operational guidelines for IMF-RFA cooperation and how to tailor them to specific needs of each RFA. RFAs are committed to continuing information and experience exchange on key topics of common interest among themselves and together with the IMF, enhancing the collaboration at the technical level by organizing annual research seminars and regular consultations. 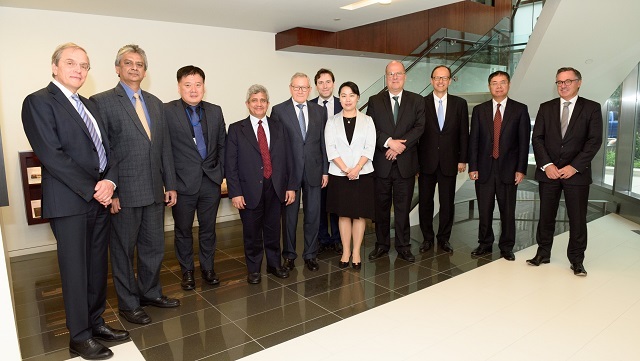 Other than the three organizing institutions, this year’s meeting was attended by representatives from the Arab Monetary Fund, the BRICS Contingent Reserve Arrangement, the Eurasian Development Bank, the European Commission, the G20 International Financial Architecture Working Group, and the IMF. Ms Christine Lagarde, IMF Managing Director, also participated in the seminar where she made a short intervention and exchanged views with the heads of RFAs. The second joint RFA Research Seminar will be organised in May 2018 and the 3rd High-level RFA Dialogue will be convened during the IMF/World Bank Annual Meetings in 2018.